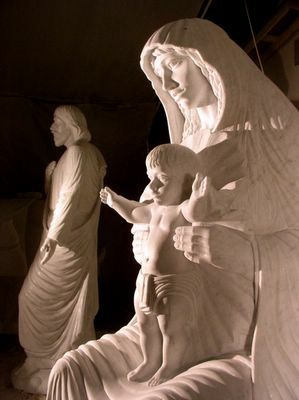 The foundational essence of my art is the eternal nature and timeless quality of stone. To heighten one's awareness for the need of harmony within nature, I am compelled to sculpt with reverence for established space. My goal is to strike the balance, and find mutuality between male and female energy. In my sculpture, I strive to restore our admiration and awe, of the nurturing and sustaining virtues of female energy. This concept of balance and harmony can draw us into symmetry with the arrangement of our existence, and serve as a visual remedy to hostility in our culture. Spiritually, I am a partner to stone; while shaping each piece, I am sensitive and open to being directed by the sculpture. Creation of art pieces is a continual process of learning and discovery, which fulfills my spiritual and emotional needs. In sculpting, I want my themes to make a contribution, to making this world a better place to live in. The creative process is my breath, my life and my religion. I place tremendous value on individualized interpretation of my work. While I may have my own ideas about the meaning of an art piece, I do not interfere, with the essential experiences of others that may uncover new meaning. To express a complex range of ideas, I combine traditional realism, abstraction, and conceptualism, as well as other textures. The masculine, penetrating and brutal properties of steel, the heavy energy of organic stone, fused with the feminine, light and translucent ambience of white marble, make up my compositions. Masculine energy sparks the polar effect, and connects with the female spirit. This combination of textures gives me the freedom to blend contrasting material; depicting a unique hybrid of racy and organic ideas. My sculptures exude ethereal and dreamy expressions, with a meditative state of acceptance, openness and nonjudgement. I am fascinated by, and attracted to clarity of expression and representational depth in historical works of art, and the sharp imagery of bold materialization in modern contemporary art. I am inspired by the works of Michelangelo, Brancussi, and Calder. I am significantly impacted and directionally inspired by Isanu Noguchi and Henry Moore. Isamu Noguchi: "Sculpture is the definition of form in space... Stone alive before man was, has a greater capacity to comfort us with the reality of our being. They are as familiar as the earth, a matter of sensibility. The essence of sculpture is the perception of space, the continuum of our existence."